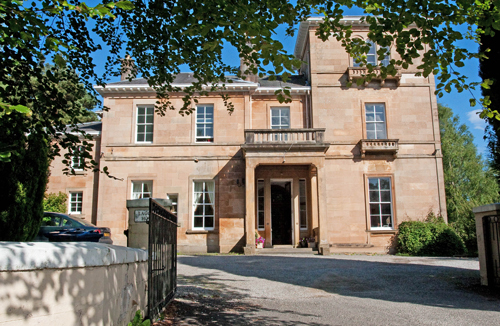 The spacious site on which it stands was feued in 1831 by Alexander Colquhan, but it was about 1850 before the mansion was built for Greenock merchant Robert Kerr. A decade later its grounds comprised 24 acres. At the request of Laggary Park resident Susan Miller, local historian and Helensburgh Heritage Trust director Alistair McIntyre has looked into the property’s past, but he says that he would welcome any further information. Robert Kerr and his family moved to Edinburgh in 1861, and the property was sold to Robert Farquhar Shaw Stewart, a Captain in the Scots Fusilier Guards. It is possible that Captain Stewart was related to the Shaw-Stewarts of Ardgowan, an ancestor of whom had once owned the land on which Helensburgh was built. 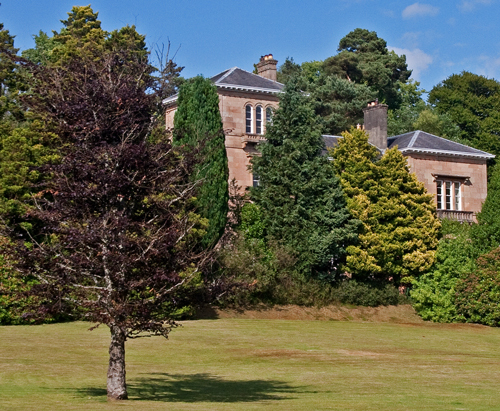 Alistair said: “It is worth reflecting that this was an era when big houses employed a full retinue of staff, and in 1861, apart from the 25 year-old Captain Stewart, his wife, and young son, there were twelve domestic servants in residence, and quite a number of staff to maintain the grounds. “Some staff were married, with their own families, and they had their accommodation outwith the big house. At the time of the 1871 census, when the proprietor appears to have been absent, staff living-in included a cook, housemaid, laundry maid and kitchen maid. In 1866 Laggary was bought by John George Hamilton from Dunoon, who had some alterations and additions done to the design of the later very prominent architect John Honeyman, but he died soon after. Other members of his family, including Colonel Christian Monteith Hamilton of the 92nd Highlanders, lived at the house until 1894, when it was sold to the Wallace family, whose members included Sir John A.A.Wallace and another Colonel, F.J.A.Wallace. From the 1920s until the mid-1930s, Laggary was owned by Nicol Paton Brown CBE, a patron of the arts, who died on July 20 1934 in the house in his 81st year, a few years after he retired from business. Information about him has been supplied by Morag Cross, of Kirkintilloch, who says that an obituary appeared in the Scotsman on July 23 1934, headlined ‘CBE for Red Cross Work, Death of Mr Nicol P.Brown'. It stated that the death occured at his residence, Laggary, Rhu, on Saturday of Mr Nicol Paton Brown, CBE, a well known West of Scotland businessman. Born on May 5 1853 and educated at Glasgow Academy and Glasgow University, he did much valuable work for the Red Cross Society during the First World War, serving as vice-chairman of the finance committee from 1914-19. He was also chairman of the St Andrew's Ambulance Association, and chairman of Glasgow Chamber of Commerce from 1926-29. He received the CBE in 1920 for his services to the Red Cross. He was connected with John Brown and Son Ltd., muslin manufacturers, Bridgeton, of which company he was chairman, and was at one time a director and customer of the Albion Motor Co. Ltd. in Scotstoun and an early motoring enthusiast. He also served as a director of the Western Infirmary in Glasgow, raising funds for the hospital, was involved with the Liberal Unionist Party, and was a keen golfer. His only son, Captain Kenneth Ashby Brown, was killed in action in France at the age of 29 while serving with the 5th Scottish Rifles, and he had three daughters, Marjory, Alison and the actress and playwright Hester Paton Brown. His first wife, Maria Crowley Ashby, died in May 1931, and only five months later, at the age of 78, he married a second time, to Edith Mary Heading in London. He and his first wife are buried at Glasgow Necropolis, where there is a memorial to his son. In 1924 he presented to the City of Glasgow a painting of the famous dancer, Pavlova, by Sir John Lavery RSA, RHA, RA, of whom he was an important patron. Lavery also painted Playing Golf at North Berwick, which Mr Brown donated to the Western Club in Glasgow, from where it was sold in 1997. Paintings by Lavery sell today for at least £500,000. After Mr Brown, no owners were listed in local directories until the early 1940s when it was bought by Mrs Amy Barbara Neilson, a widow, who was to remain in residence as the last owner of the whole mansion, latterly with just a companion. By 1971, the property was empty, and shortly after that the house was converted into four flats by new owner John McQuillan, who lived in the top right flat with the wooden walkway. Modern houses were built in the grounds by Bovis Homes. Recollections of the end of the Neilson period have come from Alison Rutherford of Helensburgh, who has strong family connections with the village. She remembers the auction of the house contents which attracted dealers from all over Britain. The lots included Sevres wall plaques, a writing bureau which fetched a high price, a large yellow pine table from the dining room, and a fine oil painting, circa 1860, of the Neilson children who had very blue eyes, long straight noses, and reddish gold hair. Descendants of a male member of the Neilson family, who was badly gassed in the First World War and went to Canada for the better air where he raised a family, travelled to Scotland, hoping to attend the auction, but the plane was delayed by fog, and they were late in arriving. They were particularly keen to purchase the oil painting, but the dealers refused to help, even though they offered well over the selling price. A Mrs Patterson left word that she had some family photographs which they might want, but it is believed they never took up the offer. The house should not be confused with Lagarie, the name of another fine mansion in Rhu, built by Helensburgh architect Alexander Nisbet Paterson in 1901 on the site of an earlier house of the same name. For some years it was a childrens home, but it too has been converted into flats. If any reader can supply any more information about the house or its various occupants, please email the editor using the Contact Us facility on the home page of this website. The exterior photos are by Donald Fullarton; the windows image is by David Lightfoot. 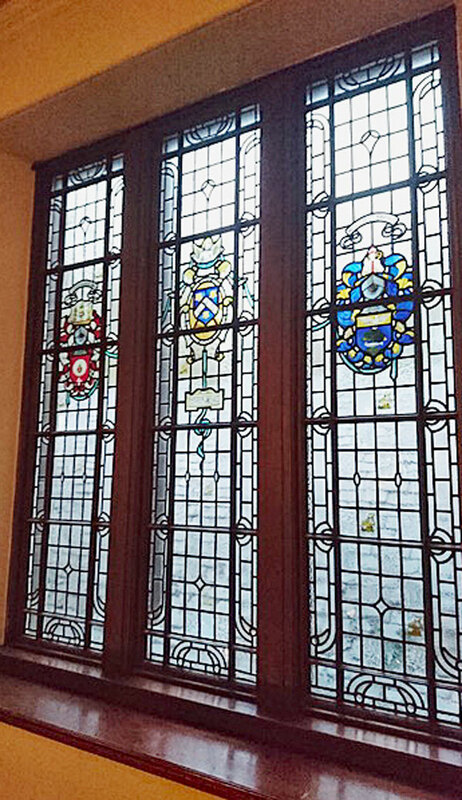 The insignia on the windows represent (from left) the Glasgow Merchants House; the Glasgow Weavers Company, although most references use the motto 'Weave Truth with Trust' rather than the other way round as in this crest; and the Glasgow Chamber of Commerce.